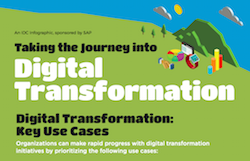 Organizations can make rapid progress with digital transformation initiatives by prioritizing use cases. SAP Cloud Platform centralizes digital transformation technologies around mobile computing, the IoT, big data and security. To learn more, download and read our infographic now.